We hope you are having lovely days at camp.We are looking forward to you coming back to school. We all miss you. Last Friday we had a Sharing Assembly and we did Folk Dancing. My favourite part was when we did stomping. I felt nervous when I went around people and when I was waving my hand. I felt happy when we were making popcorn, it was delicious but the butter was too much. We had lots of fun. The popcorn was jumping around. When we had Iron Brian we had a dancing competition. When the Iron Brian Show was finished we all got a hamburger. It was delicious and yummy. On Thursday, 26 August, I went to a K.I.T. Day with Mrs Phillips. We picked up Tevita and Lim Lim from their schools and drove to MOTAT. K.I.T. Days or Keep In Touch Days are special days when I can meet other children who wear hearing aids like me. When we got there we had some morning tea and then went to learn about how machines work. I liked it when we made a skateboard and Lim Lim pushed me around on it and then I pushed her. After lunch we had a look at the different things and went in the mirror maze four times and Tevita wanted to go in five times. At the end of the day, Mrs Phillips bought us an ice-cream. I liked the ice-cream best of all. I want to go to another K.I.T. Day next year. On Monday, after lunch time, all the classes and teachers went to our hall to see a show. The show was called the Iron Brion BBQ Roadshow and was about healthy foods. There was a man in a funny costume with a big head who was Iron Brion. There was a young woman who helped Iron Brion. Iron Brion talked about the four healthy foods. They are meat, fruit and vegetables, bread and cereals, milk, cheese and yogurt. Iron Brion was funny and there was dancing and questions and prizes. A man cooked lots of hamburgers and we all had one when the show finished. I liked the show and the hamburgers were yummy. I am looking forward to you coming back to school after ther holidays. You are lucky to be at camp. I wish you would come back from camp because we have had a lovely time. We made popcorn and that was lots of fun. We made Lime Jelly and had a disco last Friday, it happened in the hall at night and some families were there. Some school children were and some teenagers were doing the music, the songs and the rapping. When we made Lime Jelly the colour was green. I wondered what happened at your camp? Was it fun at your camp too? At the disco we had chips and drinks. When we had Iron Brion we had a competition and this man named Ollie made the burgers. It was yummy! We all ate our burgers outside the classroom. We are learning to read and write procedural texts. On Friday morning Room 4 made a jelly so we could carry out a procedure. This is how you can make one too. 1. Empty jelly crystals into jug. 2. Pour four cups of hot water into jug. 3. Stir jelly crystals until dissolved. 5. Pour jelly into plastic cups. 6. Sprinkle mallow bakes onto jelly. 7. Carry jelly to fridge. 8. Leave jelly in fridge until set. 9. Sprinkle 100s and 1000s onto jelly. Eat and enjoy your jelly. The Junior School sat quietly in the music room waiting for a big surprise. Suddenly we heard the loudest knock out side the music room. Then we put our heads down and closed our eyes. Somebody came into the room. It was Ronald McDonald! He came inside the Music room. And we thought it was some one else. 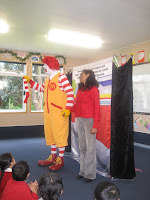 Ronald McDonald came wth his best friend Jason and his other friend Kate, And he asked us questions. He called some people Phillip or Josh. He made us laugh and it was funny. Then he got his frame out, it had a lot of squares in it as well. The colour of his suit was yellow and his sleeves were white and red. He got his picture thing out of his bag, it was red too. Then he told Miss Oldfield to read the sentence on the picture and he kept coming out behind of the picture and kept disturbing her when she started the reading. He was making us the kids laugh. And Mrs Williams, Mrs Mafu and Mrs Moodly was there and Mrs Moodly was laughing at him and she said, " What ever," to him and he said to her, "Don't you what ever me!" We all laughed because of him, and we went out happily to morning tea.